Perfect blend of the new Alfa Romeo paradigm and maximum expression of the 'meccanica delle emozioni', the new model encapsulates 105 years of style excellence and Italian technology. Its distinctive design expresses three quintessential features of Italian design: sense of proportions, simplicity and high quality surface finish. 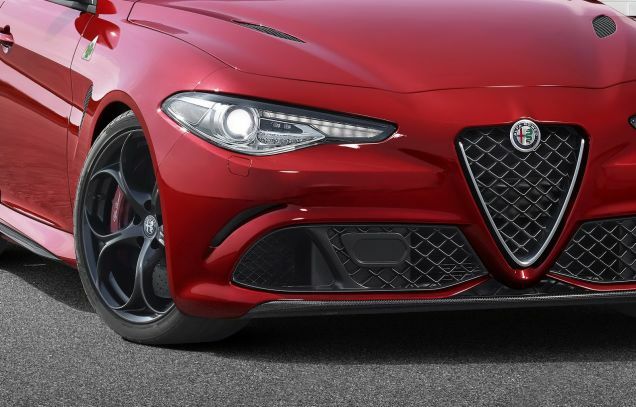 The new Alfa Romeo badge, now refreshed while preserving its legendary shape and unmistakable style, stands out in the middle of the famous front trefoil nose. The entire 'creation' centers around the driver and the promise of exhilarating driving experiences with sensitive steering, responsive acceleration and prompt shifting and braking. Rear or four-wheel drive is more than just a tribute to the most authentic roots of the Alfa Romeo legend: it is also a technical solution which guarantees high performance and astounding fun. 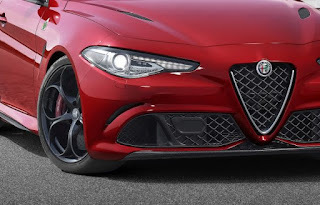 State-of-the-art, innovative engines: a six-cylinder 510 HP, inspired by Ferrari technologies, the brand's new powertrain reference, will be introduced on the Quadrifoglio version. Performance is thrilling: from 0 to 100 km/h in just 3.9 seconds. Perfect weight distribution (50/50 across the two axles), sophisticated suspensions (the front is an Alfa Romeo exclusive) and the most direct steering on the market. Unique, exclusive technical solutions, like Torque Vectoring for outstanding stability control, Integrated Brake System for considerably reducing braking distance and Active Aero Splitter for active high-speed downforce management. Alfa Romeo Giulia combines extraordinary engine performance and the ample use of ultralight materials, like carbon fibre, aluminium, aluminium composite and plastic, to obtain the best weight-to-power ratio (lower than 3kg/hp). The model was introduced to the international press in the renovated Alfa Romeo Museum in Arese, Italy ,which will reopen on June 30 for enthusiasts and researchers worldwide. 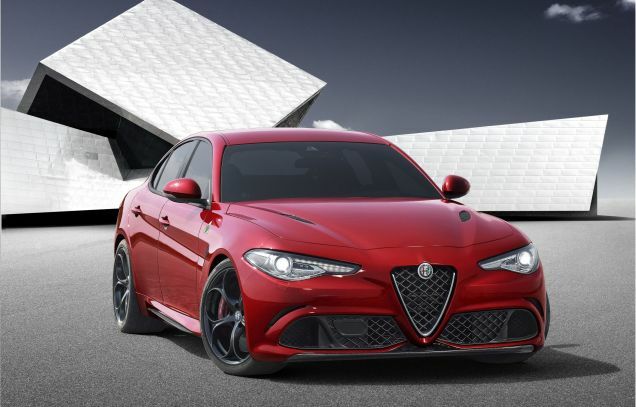 The Giulia, the top-of-the-range model sporting the legendary Quadrifoglio badge, was introduced to the international press at the Alfa Romeo Museum in Arese, near Milan, today. It was a special event and a celebration of Alfa Romeo's over one century of history: in fact, today the brand celebrates its 105th year of auto making, a goal which it shares with a very select club of manufacturers, which is even smaller when considering the brand's worldwide sales successes and its racing victories. A.L.F.A. (standing for 'Anonima Lombarda Fabbrica Automobili', which translates as 'Lombard Automobile Factory, Public Company' in English) was established on June 24, 1910. Today, on June 24, 2015, a new page of the brand which never ceases to surprise is being written by introducing a new model, a genuine manifesto which concentrates past, present and future and is one of the most brilliant examples of automobile excellence. There could be no better venue for this splendid event within the event than the new Alfa Romeo Museum in Arese. The brand's 'home' will be opening its doors to the general public again on June 30. The renovated facility hosts Alfa Romeo's most famous and innovative creations. These cars have written some of the most important pages in automotive history and are, still today, sources of inspiration for young Alfa Romeo designers. These include an elite team of engineers, designers and stylists known within FCA as the 'Skunks', a sobriquet used in industries in the USA to identify the best squads to whom the most delicate and technologically innovative missions are entrusted. Sharing a common love for Alfa Romeo and its unique concept of cars as 'mechanical creations' which transcend the realm of necessity to verge on that of the most authentic emotions and not just 'useful means of transport', the 'Skunks' have one goal: to create the Alfa Romeo of the future respecting the heritage resulting from the work and pride of thousands of people - engineers, factory workers and managers - who have taken turns in the factories, offices and on the race tracks. Alfa Romeo Giulia perfectly embodies the brand's new paradigm remaining loyal to its century-long tradition: not by chance, only who has a great past can face the challenges of the future. The respect for the brand's proud history is demonstrated also by the original badge - designed by Robilant Associati - that the new model will show to the world for the first time: the emblem has been renewed and modernised on the outside while, the distinctive shape and style elements which have made it an admired symbol the World over remain untouched. Five are the elements which made Alfa Romeo one of the world's most desirable automotive brands: distinctive Italian design, state-of-the-art, innovative engines, perfect 50/50 weight distribution, unique technical solutions and the best weight-to-power ratio. These are the indispensable ingredients for creating an Alfa Romeo. Just sitting in the new Alfa Romeo is like entering a new dimension which centers around the driver, firing emotions and the promise of exhilarating driving experiences. Merit goes to the sensitive steering, the responsive acceleration and the prompt shifting and braking. Additionally, rear or four-wheel drive is more than just a tribute to the most authentic roots of the Alfa Romeo legend: it is also a technical solution which offers high performance and astounding enjoyment. In Alfa Romeo, this is all summed up by the words 'la meccanica delle emozioni'. This bold, distinctive pay-off will be publicised worldwide in Italian only to pay homage to the homeland where the legend was born over one century ago. Still today, the brand carries Italian-made pride on everyday roads, on the most famous race tracks and in the hearts of millions of enthusiasts in the four corners of the Earth. An Alfa Romeo springs from the perfect balance of heritage, speed and beauty which makes it the highest expression of Italian style in the automotive world. The new Giulia is no exception because it encapsulates three particularities of Italian design: sense of proportions, simplicity and care for surface quality. This is the 'skin' that Alfa Romeo stylists have modelled with painstaking care on the mechanical parts. In particular, the proportions are based on the technical architecture of the entire car: for Alfa Romeo the key elements were the 50/50 weight balance and rear wheel drive. In order to balance the weights perfectly, the engine and the mechanical parts are arranged between the two axles. This is why the Giulia has very short overhangs, a long bonnet and front wings, a retracted passenger compartment 'settled' on the drive wheels and muscular rear wings which visually mark the point where power is unleashed onto the road. All this translates into a very generous wheelbase - the longest in its category - but contained in one of the most compact bodies. These proportions draw the dynamic shape of an ellipsis in plan view. Furthermore, the rounded angles and the enveloping pillars convey momentum to the car creating a 'teardrop-shaped' profile which is reminiscent of the Giulietta Sprint, one of the most beautiful cars ever made. A second aspect of the Italian style is 'simplicity' which enshrouds what is in fact the most complex creative processes in industry: designing a car. It is up to style to conceal the long, complex work behind a simple, natural line which enhances elegant shapes and sophisticated Italian taste. This approach permeates the entire history of Alfa Romeo expressed by means of clean, taut lines. For this reason, the new Alfa Romeo boasts a strong identity drawn in few simple strokes: a line gouged along the sides which marks the doors and envelops the handles and, naturally, the legendary trefoil nose, possibly the most famous and recognisable style element in automotive history. Finally, Italian style is characterised by a high quality surface finish which means creating rich, harmonious reflections across the volumes. 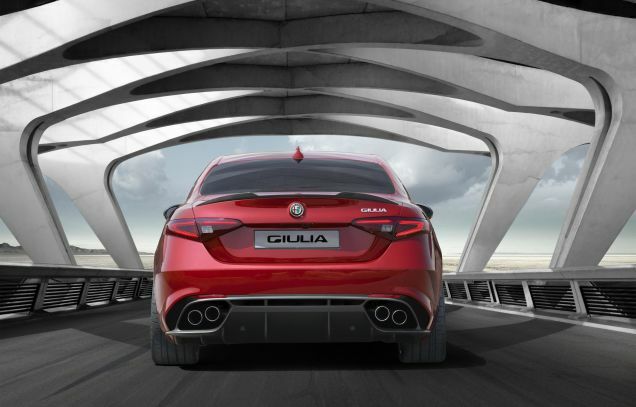 The end result is the new Giulia, a sculptured shape reminiscent of a big cat just about to pounce. The same inspiration is found inside the car. Everything is clean, essential and centers around the driver, such as the controls grouped on the small steering wheel designed to adapt to all driving styles. And more. The driver's position was 'cut' as a fabric with a diagonal tunnel, a slightly undulated dashboard and cleverly oriented instruments which convey the impression of a tailor-made suit with hand-crafted care and premium materials: carbon fibre, wood and fabrics are chosen for their visual and tactile pleasantness and assembled in such a way to make the human touch visible. State-of-the-art, innovative engines are another characterising element of a genuine Alfa Romeo. For this reason, a unique engine in terms of technology and performance, destined to become the new benchmark of the brand, has been created for the Quadrifoglio version. The six-cylinder turbo petrol tuned by engineers with Ferrari background delivers 510 HP and exhilarating performance: for instance, it accelerates from 0 to 100 km/h in only 3.9 seconds. Incidentally, despite the sensational power and torque output, the new engine is surprisingly fuel efficient and implements an electronically controlled cylinder deactivation system. Obviously, as all next-generation petrol and diesel engines, this six-cylinder is made entirely of aluminium to reduce weight particularly on the front axle of the car and make that genuinely Alfa Romeo sound. A peculiarity of the new Giulia is the astute management of weights and materials to obtain a perfect 50/50 distribution across the two axles. This is fundamental to secure the typical Alfa Romeo driving satisfaction and reached by tweaking the layout and arranging the heavier elements in the most central position possible. The suspensions are as essential for optimal ride as weight distribution. In particular, a multilink solution ensuring top performance, driving pleasure and comfort has been chosen for the rear axle. On the front, instead, a new double wishbone suspension with semi-virtual steering axis was developed to optimise the filtering effect and guarantee rapid, accurate steering. This Alfa Romeo exclusive keeps the constant caster trail on corners and can tackle high lateral accelerations as a result of the always perfect footprint.In any situation and at all speeds, driving Alfa Romeo Giulia with the most direct steering ratio available is natural and instinctive. As a further expression of the Alfa Romeo engineering culture, the design, the build and the choice of materials of the chassis and the suspensions is always perfect. As a consequence, it was decided that electronics should only be used to make the driving experience guaranteed by excellent basic mechanicals even more exhilarating. This is demonstrated by the exclusive technical solutions present on the new car, like Torque Vectoring with a double clutch to allow the rear differential to control the torque delivery to each wheel separately. In this manner, power transmission to the road is improved also in low grip conditions. So, the driving is safe and fun without ever having to run up against an invasive stability control system. The Integrated Brake System - an innovative electromechanical system which combines stability control and a traditional servo brake for instantaneous brake response and consequent record-breaking stopping distances in addition to the all-important weight optimisation - is being introduced on the new Alfa Romeo. Together with an excellent Cx, a perfect balance of forces on corners and downforce behaviour, the new model has Active Aero Splitter, a front system which actively manages downforce for higher performance and better grip even at high speed. These state-of-the-art systems are all governed by Chassis Domain Control, the 'brains' of the on-board electronics which assigns the specific task of optimising performance and driving pleasure to each one. The new Alfa Romeo Giulia also features a renewed Alfa DNA which modifies the car's dynamic behaviour according to the driver's selection: Dynamic, Natural, Advanced Efficient (energy efficiency mode implemented for the first time on an Alfa Romeo) and naturally Racing (on high performance versions). The passenger compartment of the new car offers the best in terms of quality, safety, equipment and comfort with a specific, profoundly Alfa Romeo style element: the centrality of the driver. Not by chance, all the main controls are incorporated in the steering wheel as on a Formula 1 car, while the human-machine interface consists of two simple, user-friendly knobs for adjusting the Alfa DNA selector and the infotainment system. To obtain an excellent weight-to-power ratio (remarkably lower than 3kg/hp), Alfa Romeo Giulia combines extraordinary engine performance and the ample use of ultralight materials throughout. For example, carbon fibre was chosen for the propeller shaft, the bonnet and the roof and aluminium was picked for the engine, brakes, suspension (including front domes and front and rear frames), in addition to many other body components, such as the doors and the wings. Furthermore, the rear crossmember is made of aluminium composite and plastic. In order to decrease the total weight, the braking system was tweaked using aluminium elements and carbon ceramic discs and the seats have a carbon fibre structural frame. Despite all this weight optimisation, the car boasts the best torsional rigidity in its class to guarantee quality over time, acoustic comfort and handling even in conditions of extreme stress.